We would be happy to accommodate your wedding in our beautiful, historic sanctuary! Our sanctuary can comfortably seat approximately 200 guests and has a center aisle suitable for a traditional procession. The church has ample parking, a wheelchair ramp, and a handicapped accessible rest room. 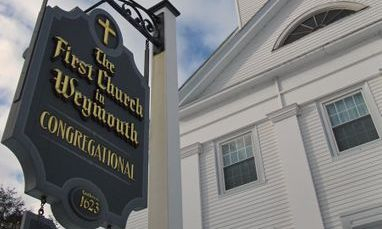 Couples desiring to have their wedding ceremony at The First Church in Weymouth should contact the church directly. We will check the availability of the date and hold it on a first come, first served basis. Couples desiring to have their wedding ceremony elsewhere, with our Pastor officiating, should make arrangements with him directly. Our Pastor does not charge a fee for officiating weddings, and is available to officiate at other venues as time and schedule allow. Music for weddings at The First Church in Weymouth is arranged directly with our church organist, and her contact information will be provided to you when you contact the church.